**As usual, I halved everything for 2 people. I actually sliced 2 boneless skinless chicken breasts in half horizontally, so I had 3 good cutlets and pieces of a 4th from a not-so-excellent slicing job. It was more than enough. 1. Adjust an oven rack to the middle position and heat oven to 200 degrees (I didn’t need to do this for 2 people). Combine the minced garlic, 3 tablespoons of the oil, and the cutlets in a zipper-lock bag and refrigerate while preparing the remaining ingredients. 2. Pulse the bread in a food processor until coarsely ground. Bake the breadcrumbs on a baking sheet until dry, about 2o minutes (I skipped this whole step). 3. Spread the flour in a shallow dish. In another shallow dish, whisk the egg whites until foamy. Combine the breadcrumbs, garlic powder, and cornstarch in a third shallow dish. 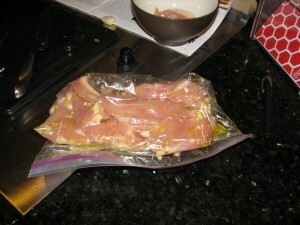 Remove the cutlets from the bag and season with salt and pepper. 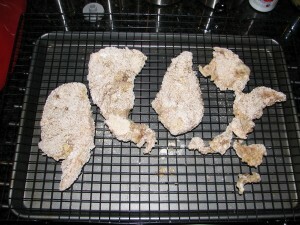 One at a time, coat the cutlets lightly with flour, dip in the egg whites, and dredge in the crumbs, pressing to adhere. Place the cutlets on a wire rack over a baking sheet and let dry for 5 minutes. 3. 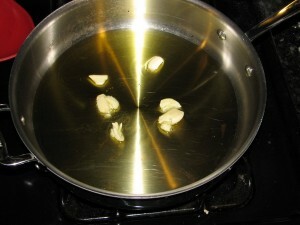 Heat 1/2 cup of the oil and 3 of the smashed garlic cloves in a large nonstick skillet over medium heat until the garlic is lightly browned, about 4 minutes. (Heat the oil and the garlic together, don’t add the garlic after the oil is hot). Discard the garlic and fry 3 of the cutlets until crisp and golden (I was able to fit my 3.5 cutlets in the pan), about 2 minutes per side. Transfer to a paper towel-lined plate and place in the warm oven. 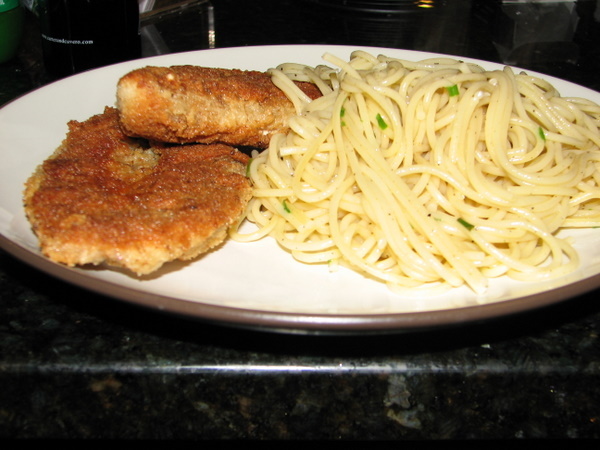 Discard the oil, wipe out the skillet, and repeat with the remaining oil, garlic, and cutlets. Serve.